Specialist Anthony Matesic works at his post on the floor of the New York Stock Exchange, Wednesday, Jan. 27, 2016. Stocks soared on the last trading day of January, with Microsoft, Visa and other tech stocks making the biggest gains in a broad market rally Friday. Indexes rose throughout the day and finished with their biggest gains in about five months. Asian stocks jumped after the Bank of Japan moved to stimulate the economy, and European markets also rose. In the U.S, tech stocks climbed following strong quarterly results from Microsoft and Visa. Materials companies and banks also made large gains, and the price of oil rose for the fourth day in a row. The U.S. government said Friday that the economy slowed in the fourth quarter, a possibility that had worried investors. But its estimate of the country's gross domestic product was about equal to analysts' forecasts and didn't hurt stocks. The Dow Jones industrial average surged 396.66 points, or 2.5 percent, to 16,466.30. The Standard & Poor's 500 index rose 46.88 points, or 2.5 percent, to 1,940.24, as more than 480 of its component stocks rose. The Nasdaq composite index jumped 107.28 points, or 2.4 percent, to 4,613.95. Stocks made some big gains in the last two weeks, but still finished January with hefty losses. Microsoft added $3.04, or 5.8 percent, to $55.09 after its profit and revenue beat expectations. The tech giant posted strong results from its cloud computing business and the unit that sells PC software and Surface tablets and Xbox game consoles. Visa and MasterCard both rose after reporting solid results. Visa climbed $5.16, or 7.4 percent, to $74.49 and MasterCard picked up $5.60, or 6.7 percent, to $89.03. E-commerce company Amazon took its largest one-day slide in more than a year. Amazon's quarterly profit more than doubled, but it still fell short of Wall Street's forecasts because of increased costs. Some of those related to its Fulfillment by Amazon service, which handles shipping for sellers and makes them eligible for Amazon Prime shipping. The stock lost $48.35, or 7.6 percent, to $587. Honeywell advanced $5.23, or 5.3 percent, to $103.20 following its fourth-quarter report, and General Electric added 89 cents, or 3.2 percent, to $29.10. Xerox said it will split into two publicly traded companies after pressure from activist investor Carl Icahn. Its stock gained 52 cents, or 5.6 percent, to $9.75. The Commerce Department said U.S. gross domestic product grew only 0.7 percent over the last three months of 2015, while analyst expected 0.8 percent. The agency said consumers spent less, businesses invested less, and exports were down because of global instability. The U.S. economy has been expanding for six and a half years, but on Wednesday the Federal Reserve cautioned that the U.S. economy is slowing down. The Fed also expressed concerns about global growth. Stocks tumbled after the Fed released its assessment. Crude oil prices kept rising. Benchmark U.S. oil added 40 cents, or 1.2 percent, to $33.62 a barrel in New York. Brent crude, a benchmark for international oils, gained 85 cents, or 2.5 percent, to $34.74. Oil prices have increased for four days in a row as investors hope for cuts in global production. U.S. government bond prices rose. The yield on the 10-year Treasury note fell to 1.93 percent from 1.98 percent. European bond yields also sank. The euro weakened to $1.0829 from $1.0955. Consol Energy jumped $1.19, or 18 percent, to $7.94 following its fourth-quarter report and another increase in the price of natural gas. Electronic Arts traded lower. Its profit and revenue forecasts fell a bit short of Wall Street estimates. The video game maker said sales of its "Star Wars: Battlefront" game were strong, but analysts said investors were disappointed with the number of downloads, which are more profitable than sales of physical games. The stock gave up $5.25, or 7.5 percent, to $64.55. That was its largest daily loss in almost three years. January was a tough month for the market, and the beginning of the year was the worst in the history of the Dow average and the S&P 500 index. Both fell into a correction, or a drop of at least 10 percent from a recent peak. 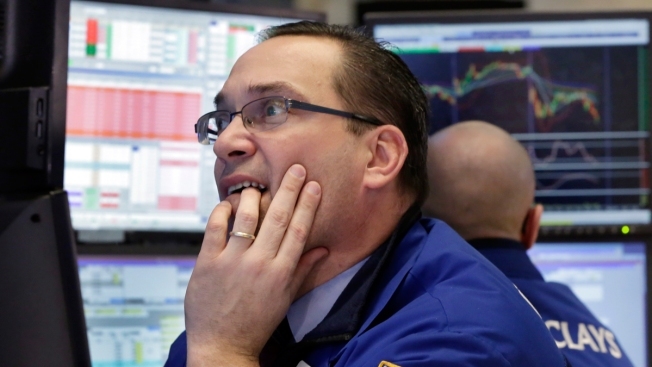 The small-cap Russell 2000 index entered a bear market, which means a 20 percent slide. The Dow and S&P 500 both fell more than 5 percent in January, while the Nasdaq lost almost 8 percent. For each index, that was the largest drop in a single month in years. The Russell finished January down almost 9 percent. Google's parent, Alphabet, might soon overtake Apple as the world's most valuable publicly traded company. Alphabet has surged over the last year while Apple has struggled. Both companies are valued at more than $500 billion, and Apple is currently about $16 billion above Alphabet. On Friday the Bank of Japan said it will charge money to banks that leave large amounts of cash parked at the central bank. The policy is intended to encourage commercial banks to lend more money. That could stimulate investment and growth in Japan's struggling economy. Japanese bonds and fell the dollar got stronger compared to the yen. Friday afternoon the dollar traded at 121.10 yen, a huge move for the currency, which traded at 118.78 yen late Thursday. Luke Bartholomew, investment manager at Aberdeen Capital Management, said the move by Japan's central bank is a change of course for the bank and for its governor, Haruhiko Kuroda. "The surprise is they're going to negative rates a little more than a week after Kuroda explicitly said they had no intention of doing so," Bartholomew said. He said the Bank of Japan will need to do more to strengthen Japan's economy. Japan's Nikkei 225 jumped 2.8 percent and Hong Kong's Hang Seng gained 2.5 percent. The Shanghai Composite in mainland China rose 3.1 percent. European indexes also rose. Germany's DAX climbed 1.6 percent. Britain's FTSE 100 added 2.6 percent and France's CAC 40 advanced 2.2 percent. Wholesale gasoline picked up 2.4 cents, or 2.2 percent, to $1.103 a gallon. Heating oil added 2.4 cents, or 2.3 percent, to $1.055 a gallon. Natural gas rose 11.6 cents, or 5.3 percent, to $2.298 per 1,000 cubic feet. Metals prices didn't change much. Gold rose 80 cents to $1,116.40 an ounce and silver gained 1.1 cents to $14.243 an ounce. Copper added 1.6 cents to $2.067 a pound.